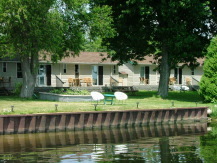 Our lodgings are situated directly on the waterfront with a deck or porch overlooking the 1000 Islands. Ceiling fans to ensure your summer comfort. Fully equipped kitchen with major appliances, dishes, and utensils. Satellite TV, DVD players and Wireless Internet Service on the premises. Boat ramp with available docking & parking (for cost see the boating and fishing page). A fish cleaning station and complimentary gas barbecue facilities. More detailed information about the cottages and efficiency units is available further down this page. For inquiries or to make a reservation, email us. 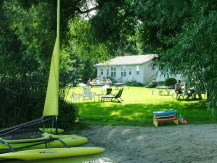 Rates for the current season are available. Want to know what to bring? See our list. Policies including deposits, check in/checkout, and pets are explained further down this page. Efficiency units include a comfortable bedroom with 2 double beds, a kitchen, and a bathroom (with shower only). The kitchen has a fridge, microwave, kettle, toaster, toaster oven, coffee maker, electric frying pan, and a hot plate with different applications (no stove). A sliding glass door goes onto a deck overlooking the water. Maximum occupancy is 4 people. One Bedroom Deluxe units offer a separate bedroom with 2 double beds and a living/dining room with a double pull-out couch. The kitchen area is fully equipped including a stove. There are 2 washrooms; one with sink and toilet and the other includes a shower. A sliding glass door from each room goes onto a deck overlooking the water. Maximum occupancy is 6 people. One Bedroom Cottages have a separate bedroom with one double bed and a dining/living room with a double pull-out couch. The kitchen has a fridge, microwave, kettle, toaster, toaster oven, coffee maker, electric frying pan, and a hot plate with different applications (no stove). The bathrooms have a mini tub (4') with shower. A small porch goes onto the lawn which is directly on the waterfront with a picnic table and outdoor firepit. Maximum occupancy is 4 people. Two Bedroom Cottages have two bedrooms with one double and one single bed in each room. They have a separate living/dining room, a fully equipped kitchen with stove, and a 4 piece washroom. A small porch goes onto the lawn which is directly on the waterfront with a picnic table and outdoor firepit. Maximum occupancy is 6 people. All rates are based on an occupancy of 4 people per unit, except 2 Bedroom Cottages and One Bedroom Deluxe units which can accommodate 2 additional people (6 total) at an additional cost of $10/night/person or $60/week/person. Rates are in Canadian funds and require a minimum stay of 3 nights during peak periods. Rates are subject to local taxes which are 13% HST. A one night non-refundable deposit is required at confirmation. This deposit may be applied to future reservations for cancellations made three weeks prior to arrival. We accept Cash, Visa, and Mastercard (5% reduction on cash payments). Personal cheques are accepted only for the one night deposit. Check in time is after 2:00 pm and check out time is 10:00 am unless other arrangements are made in advance. Pets are not allowed in cottage facilities. We do offer a complimentary kitchen cupboard for guests where additional items may be borrowed during your stay such as an iron, large corn or pasta pot, garlic squeezer etc.